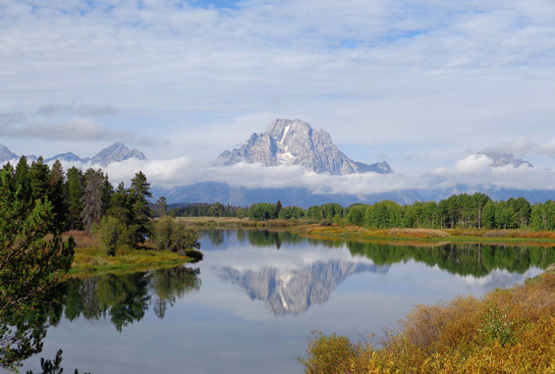 can be viewed from lookout points along nature trails or by kayak." 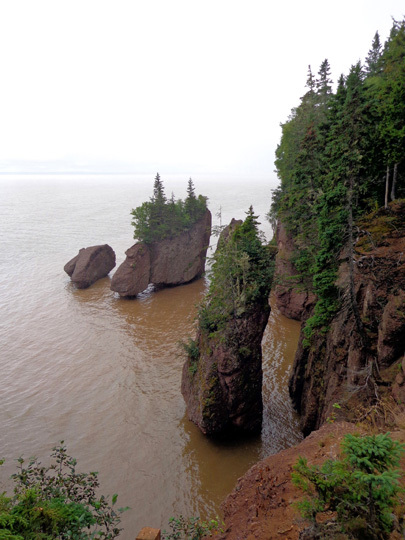 The Bay of Fundy has some of the world's highest tides, with a variance of up to 52 feet from high to low tide in about six hours' time -- gazillions of gallons of water flowing in and out, in and out, twice a day. If you think about it, that's pretty phenomenal. Imagine what that would look like along the coastlines of the United States! 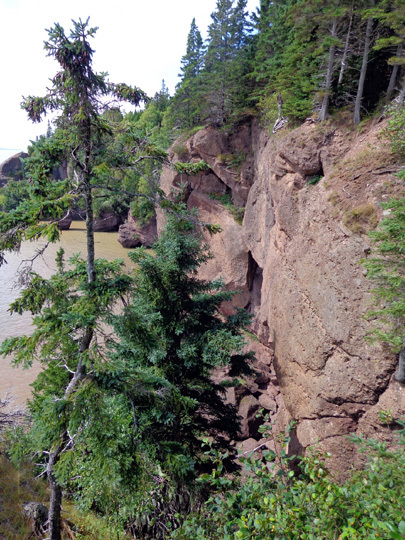 The Fundy tides tend to have the most variance in the upper, closed ends of the bay near Amherst and Truro but the entire New Brunswick and Nova Scotia shorelines along the bay are affected. Even some of the rivers that empty into the bay are noticeably higher/lower for several miles inland as the tremendous tides ebb and flow. 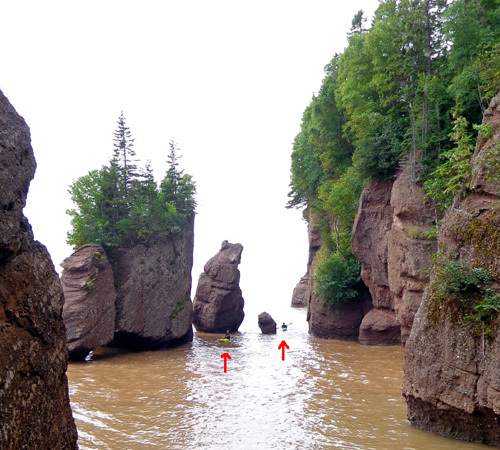 The city of St. John, NB is famous for its "reversing rapids," when the tremendous inflow of water from the bay twice a day causes the rapids in a narrow, rocky gorge in the St. John's River to flow backwards! There is also a small bore tide of 8-18" going up the width of the Petitcodiac AKA Chocolate River in Moncton twice a day but we haven't observed it. After the bore the nearly empty river basin rapidly fills up again with water, raising the level of the river by 25 feet. On Sunday the "supermoon" is supposed to bring a super tidal bore that surfers will enjoy. 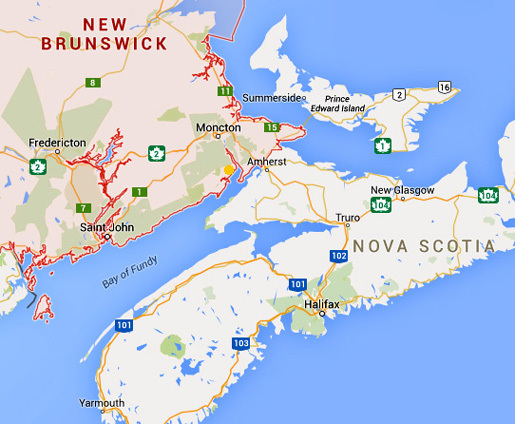 Too bad we won't be here for that; we're leaving Moncton on Sunday morning. 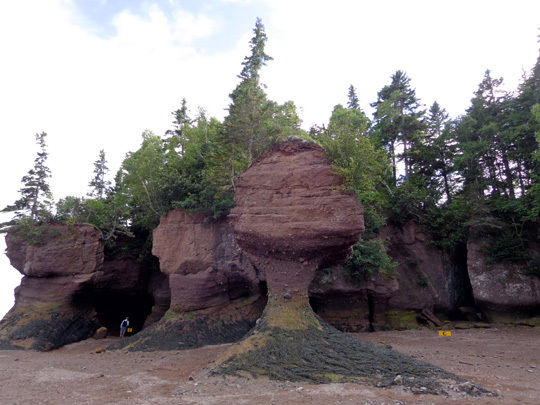 Another graphic place to observe these extremely high and low tides is the popular Hopewell Rocks Ocean Tidal Exploration Site near Hopewell Cape, located on NB 114 about 40 miles from downtown Moncton. 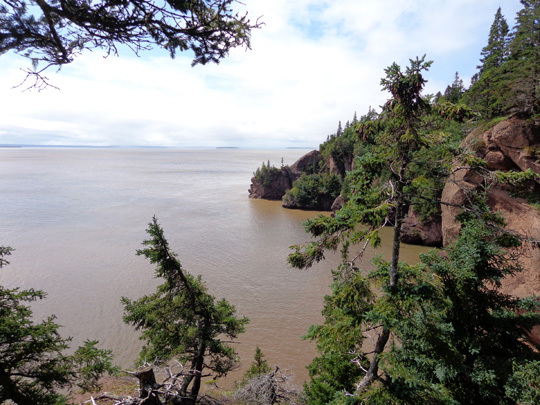 The site near is the mouth of the Petitcodiac AKA Chocolate River. I marked the location on the map above with an orange dot. 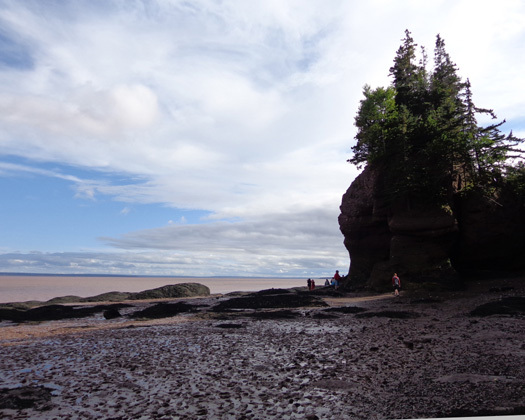 We visited Hopewell Rocks twice today -- at high tide this morning, and at low tide this afternoon. 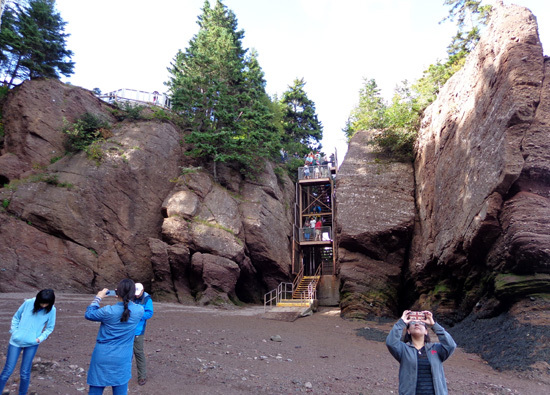 Hiking (or riding a tram) down to the observation deck above the beach at the very highest and lowest tide during a six-hour span of time is the best way for visitors to observe the 40+ foot variance of water at this location. 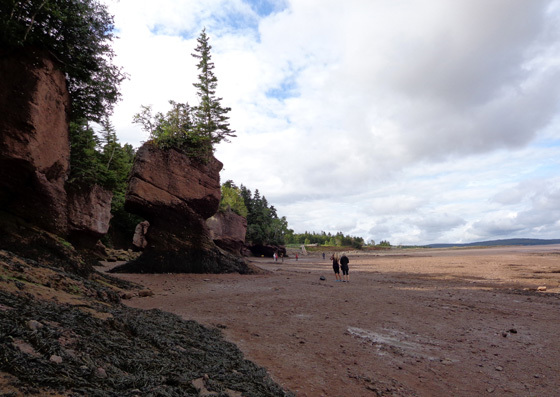 One of the rangers told us today's tidal variance was 41 feet from high to low. In a few days, when the moon is full, it will be 46 feet. That's about the height of a four-story building. 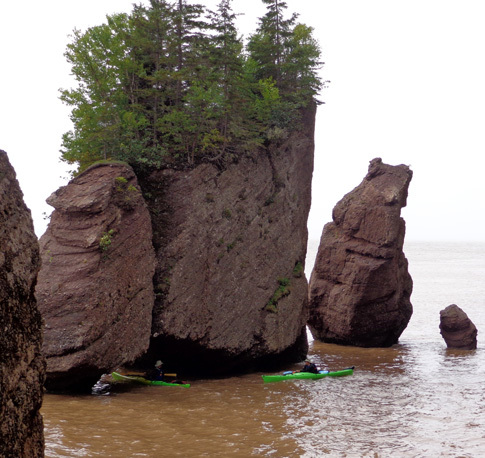 Although I've tried to illustrate this phenomenon with the accompanying photos, Hopewell Rocks is one place where you really have to see it with your own eyes to truly appreciate it. Actually, there are a lot of places like that! 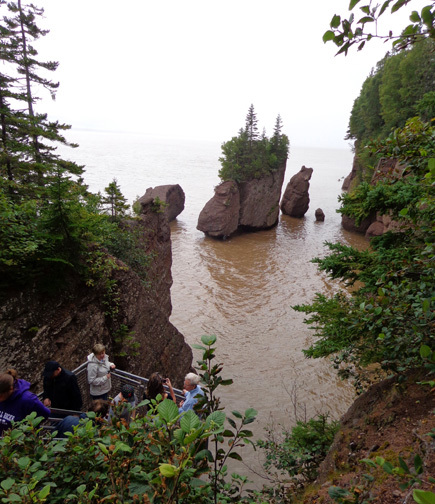 If you visit the site, check the tide schedule for Hopewell Rocks first. 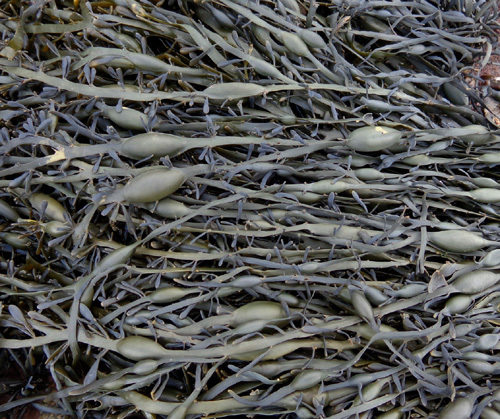 Today the tide peaked about 11:20 AM. We got to the entrance gate a few minutes before that but by the time we walked down to the observation deck and steps to the beach it was 11:45. We just missed the highest point of the tide but we got the general effect of it. Admission was $15.50 CA for the two of us. That's the senior rate and it was less in U.S. money. 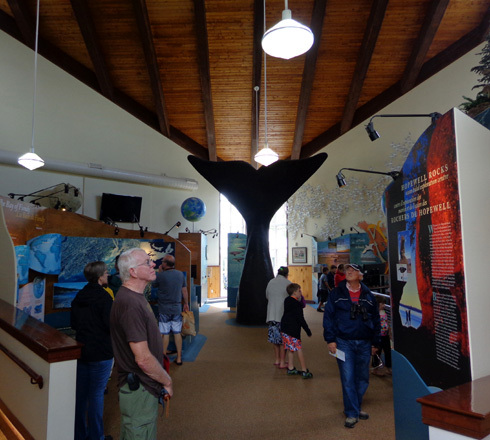 The fee includes access to the visitor center, trails, and beach. 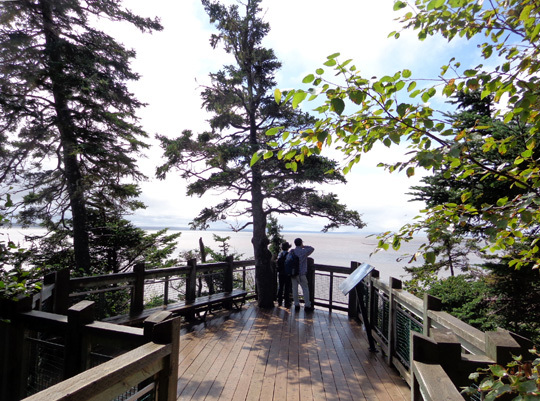 There is a wide half-mile trail down to the observation deck, which has stairs to the beach. 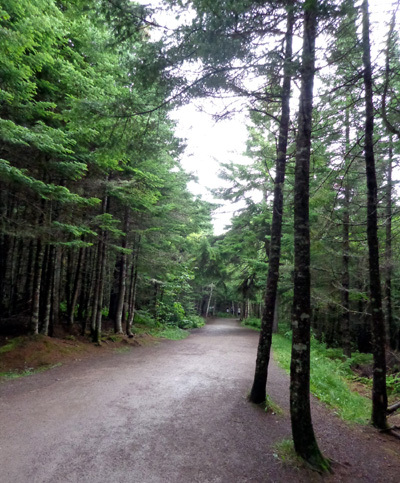 Most of the trail is shaded. Jim and I walked down and back both times we were there. 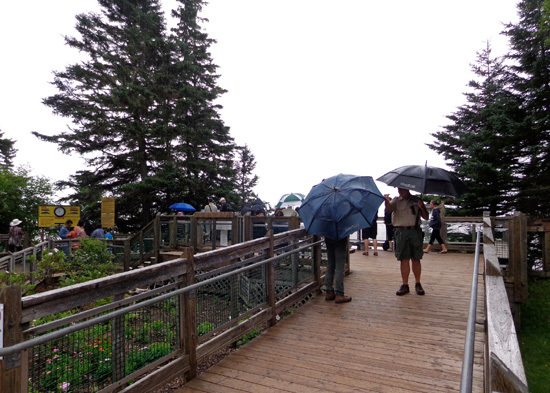 Because of the distance, steps, and slope, some people pay $2 to ride a shuttle to the overlook. 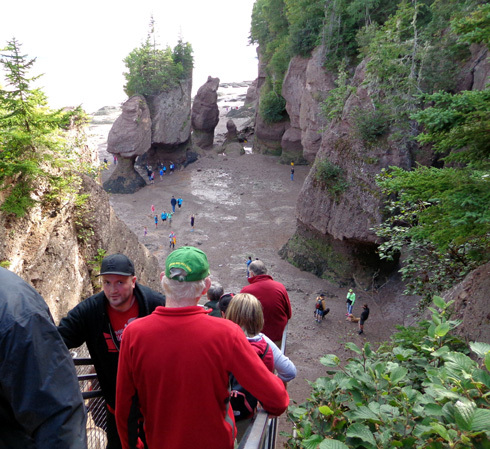 To get to the beach when the water recedes, however, you've got to go down a bunch of open metal grated steps at the deck or take a longer sloping path down to the far NE end of the beach. Dogs are allowed on the trails but we didn't take Cody or Casey with us either time because of the number of people and the metal grated steps going down to the beach; those are rough on a dog's paws. It was cool enough to leave them in the truck today. At high tide this morning I took a few pictures of the "flower pot" rocks from the observation deck and as far down the steps as we were allowed to go. Fog and light rain limited views of the bay from the observation deck this morning. 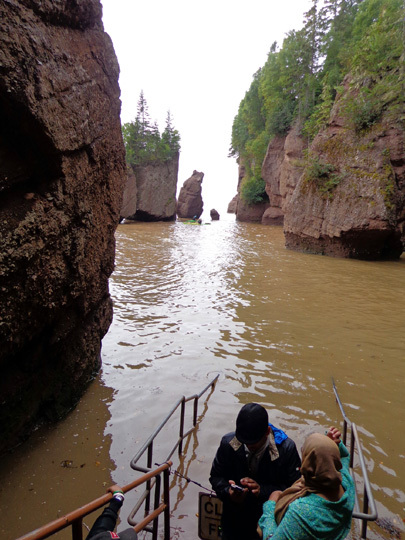 As the water slowly receded they were able to barely paddle through the arch. 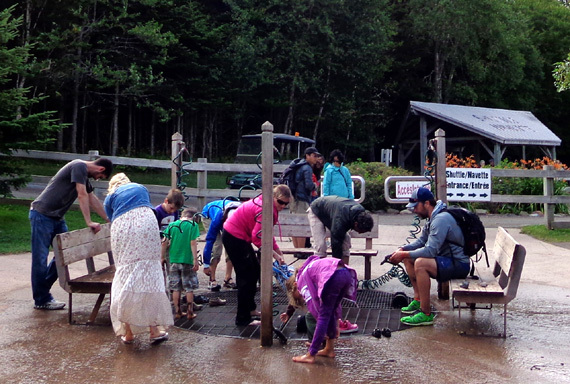 This is a popular activity at high tide, kind of like "threading the needle." 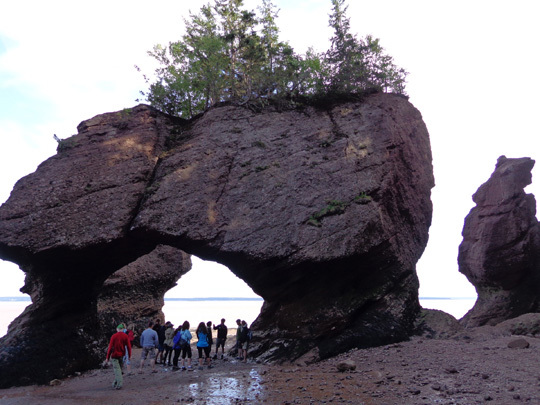 I've seen pictures of kayaks in that location at high tide in promotional literature, and people walking under the arch at low tide. That was the first place I wanted to examine hours later when the water was out and we could see the ground and the whole archway. Even though we hadn't seen that view yet, we knew it would be awesome to see the difference this afternoon -- but we had to wait about six hours to see that phenomenon. Ah . . . some blue sky to the southwest! 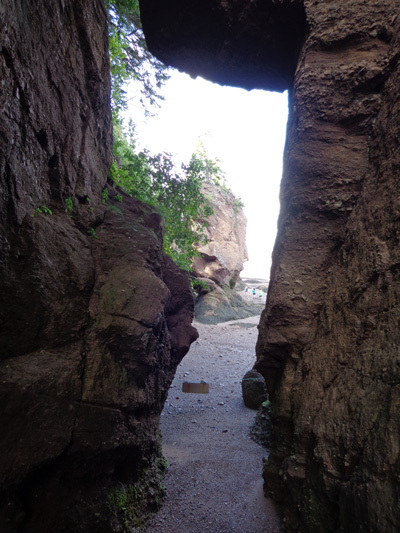 At high tide, the cave isn't visible but I could see what it looks like at low tide in pictures on an interpretive panel at the observation deck. 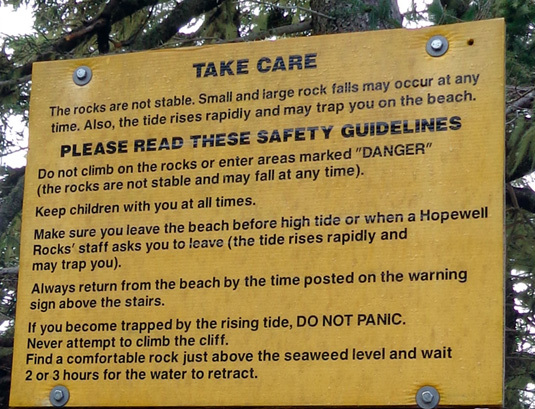 There is no entrance to the beach at that location; I don't know if you can walk to it from another location when the tide goes out. There are trails to other observation points to the west of the visitor center but we didn't go to them either time we were there today. We checked out the food options at the restaurant next to the visitor center and decided to wait until we got to Alma to eat a late lunch. 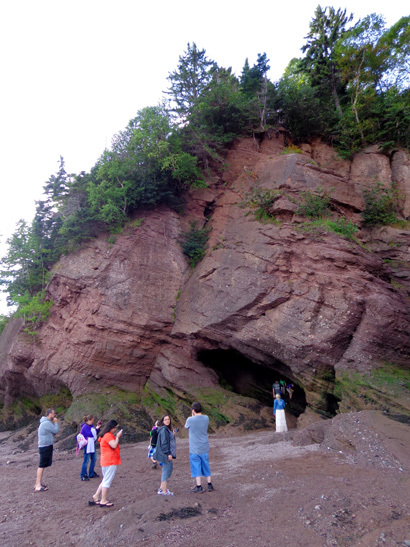 Inside the handsome visitor center we scanned the exhibits, which explain how the Bay of Fundy and the Hopewell Rocks were formed over the millennia (plus other information), then headed west to Alma and Fundy National Park. I talked about those places in the previous entry. 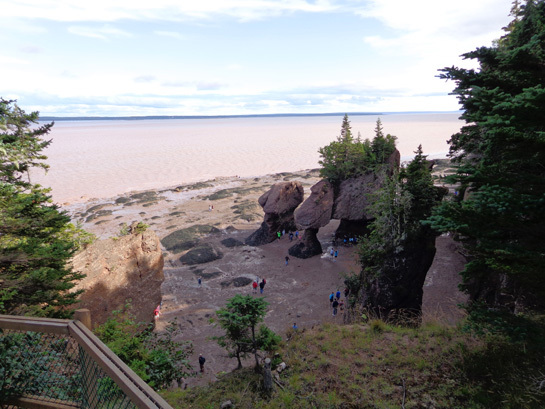 The best was yet to come, and other visitors apparently already knew that because the parking lot at Hopewell Rocks was about three times as full at low tide late this afternoon as it was at high tide this morning. Now we know why -- it's much more fun then because you can get down on the beach and walk amongst the "flower pots!" Low tide was about 5:50 PM. We got to the entrance about 5:30 and walked down to the observation deck again, reaching the beach just before the lowest point in the water level. WOW!! The difference in the scene below us was simply amazing. 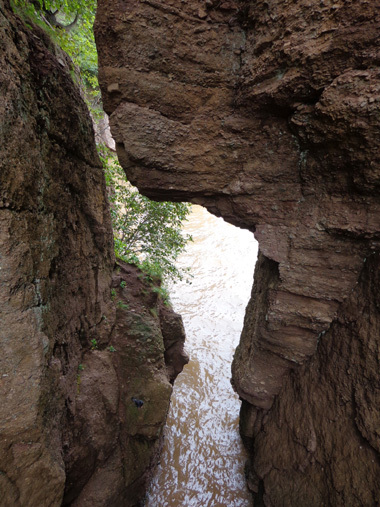 This view through the rock pillars was full of water this morning. 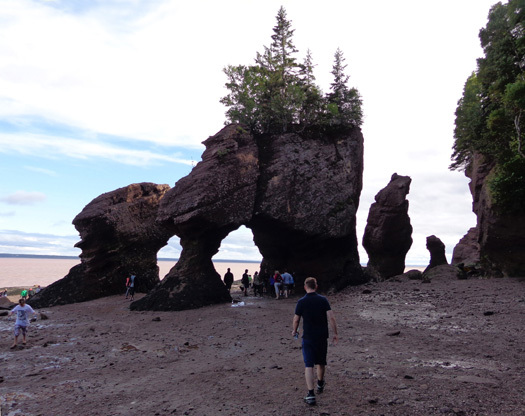 We could see the base of all of the carved "flower pot" rocks in both directions on the beach. 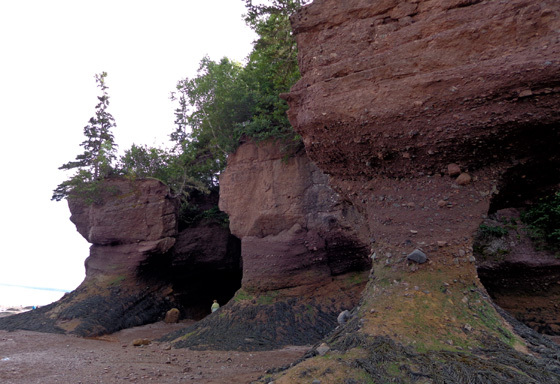 It was fun to walk along the upper beach and photograph the rock pillars. All the people in the photos give them perspective. 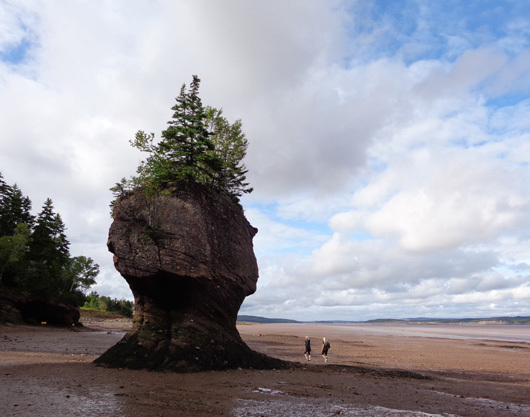 Many of the "flower pots" are 40-50 feet tall and have trees and other vegetation on top of them. The colorful red sandstone contrasts with the various green shades of plant materials. 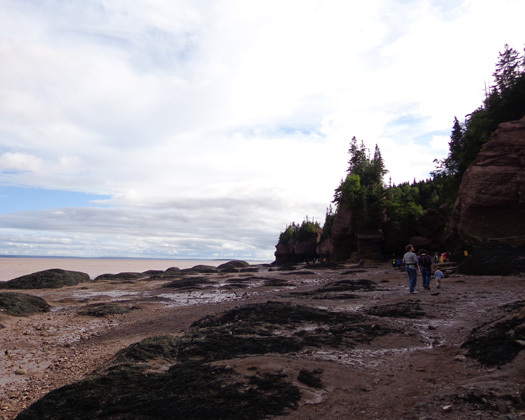 The rocky beach, which extends quite a distance at low tide, was interesting in itself. We've never seen beaches quite like this one. 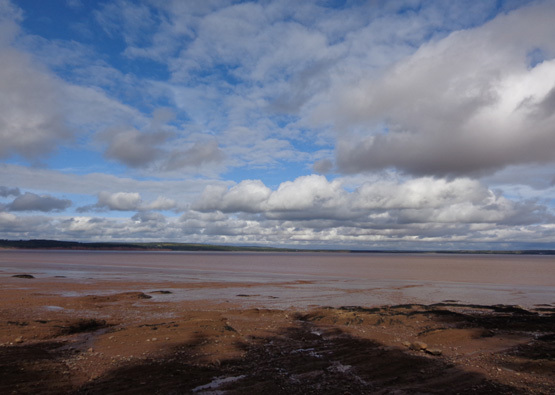 The beach drops down to mud flats at low tide. Because of all the rocks they don't look much like the mud flats along Turnagain Arm in Alaska. Some of the coastal rainforest terrain, trees, and other plants did remind us of Southcentral Alaska, though. 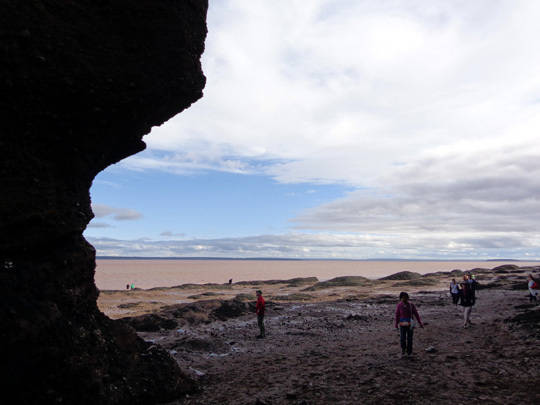 It was with some reluctance that we left this place after exploring the beach for more than half an hour. We were getting hungry and wanted to find a nice seafood restaurant for dinner in one of the little towns on the way home. 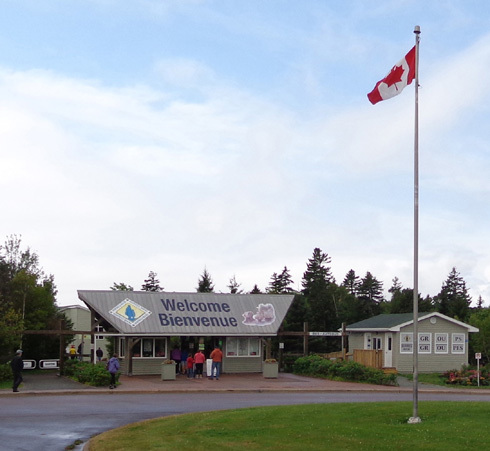 We didn't see any restaurants that interested us until we got to Skipper Jack's in Moncton a couple miles from our campground. We wanted more seafood and this place was a good choice. We were seated promptly and got dinner in about 15 minutes. Jim had a seafood platter with deep-fried shrimp, mussels, clams, and white fish and a baked potato (choice of three kinds of potatoes or salad/slaw). I had one of the specials with clams, mussels, and lobster in their shells, prepared in a broth of rhubarb wine, garlic, and lime and served over peppers, broccoli, and mushrooms. Both dinners were good and the price wasn't too bad ($12.99 Canadian each, less in American $$$). I also had a small glass of tasty rhubarb wine from a local winery, Magnetic Hill. It was a nice ending to a most interesting day. 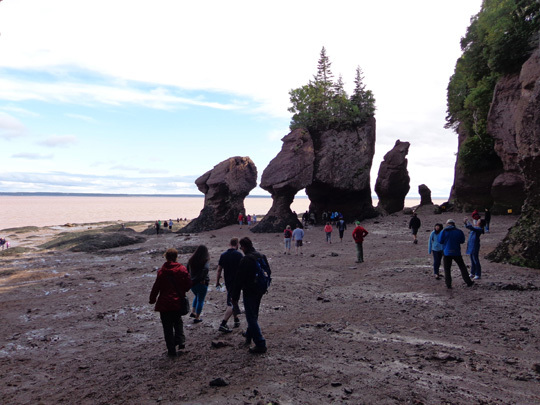 All drama and joking aside, we highly recommend visiting Hopewell Rocks at both very low and very high tide if you're ever in New Brunswick, Canada. It's fascinating. I kinda wish we had stayed another couple hours to see the tide come back in part way so we could see the water at an intermediate stage.